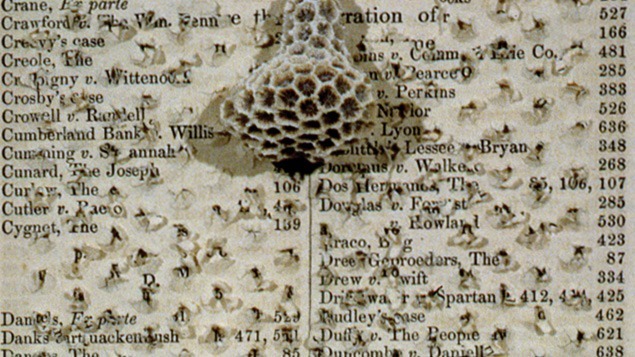 Discarded law books, science texts, encyclopedias, and dictionaries become the raw material for Margaret Whiting’s mixed media constructions. By altering these authoritative texts and juxtaposing them with objects found in nature, Whiting proposes new relationships between the written word and the natural world referred to in the texts. Her manipulation of these documents is not meant to destroy, but rather to transform them—providing a new context for the information contained within their pages. The volumes with which Whiting works are of interest to her because they contain legal decisions and accepted knowledge that have shaped history and influence our present day lives. The artworks featured in Margaret Whiting: Laws of the Land refer to landscape, nature, and topography in the subtlety of the objects’ surfaces. When visible, the written words make these connections literal. Taken together, the pieces in this exhibition represent the connection between the laws created by humans and the laws of nature—what Margaret Whiting perceives as the laws of the land.